Magadh Mahila College offers education from the Under-Graduate level to the Post-Graduate level for girl students in all streams viz. science, humanities, social science and fine arts from the regular courses. The college also offers vocational courses in computer applications, Commerce, Management and Sociology. 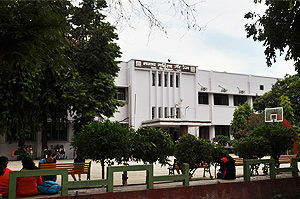 Facility is also available for short-term courses in Computer Applications run by the Computer Department for the students, staff and ex-students of the college. Every candidate will apply to the college on a prescribed application form available from the college sales counter along with the prospectus. Form for admission to hostels can also be obtained. The Application form should be filled up with all the required details. Completed forms should be submitted in the college office. A candidate who wishes to be considered for more than one course should submit a separate application for each course. Candidates who have applied for a particular course will be considered for admission to that course only. Completed applications may also be mailed to the College. Admission shall be made on the basis of Merit List prepared after the written entrance test to be conducted by the college according to the notification of Patna University. After obtaining the recommendations of the Admission in charge with the consent of the Principal, the student shall be admitted to the specified course in the college..
On getting her candidature confirmed, the candidate will deposit the fees by challan to the extension counter, Allahabad Bank in the college premises. Admission is finalised only on payment of the fees. It should therefore be done within the time mentioned in the notification of the admission list . 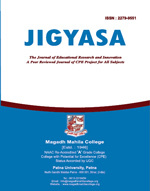 An applicant must have passed Senior School Certificate (10+2) or the Indian School Certificate (12 years) or an equivalent Examination recognised by Patna University with 45% marks in aggregate. (a) Provisional certificate from the institution last attended. Seats for different caste categories i.e OBC, EBC, SC & ST are reserved as per the rule of the state government. They would be required to submit an attested copy of the caste certificate issued by any competent authority (S.D.O or D.M.). Seats are reserved for children/wives/widows of defence personnel. 2 seats in each class are reserved under this quota. All students who wish to avail admission under this quota must submit a seprate form available on the counter along with the relevant certificate from any competent authority (as mentioned in the College Prospectus). 3% of the total seats are reserved for Physically Challenged candidates. Such candidates are admitted through the Office of the Dean of Students Welfare in accordance with the University procedures. The relevant documents procured from a competent medical authority and the certificate of authentication must be submitted as per the rules laid down in the College Prospectus. The College, however, retains the right to check and verify the correctness of facts and, in case, the candidate is found not eligible under this category, the College reserves the right to cancel the admission. The university medical boards also examines the correctness of the facts. 5% of the total seats in any course is reserved for wards of teaching and non-teaching staff of Patna University. Students wishing to apply on the basis of proficiency in fine arts (Painting, Dance, Music, Drama) and Music (for Arts Faculty only) should apply on additional form available at the counter on the payment. This form should also be submitted along with the original application form. A trial will be held on the notified date and time in the college premises. The names of the selected candidates will be notified on the college Notice Board after getting the approval of the University. Limited seats are available in the campus hostels. Students seeking hostel accommodation should submit a separate hostel application form along with the original application form within the notified date. Immediately after the process of admission to the college is completed, students seeking admission to the hostel and who have applied for admission by the last date, are required to contact the Admission-in-charge, who prepares the list of eligible candidates in order of merit. Various forms are available on this website to download.